The Guardian has a regular food feature – “How to cook the perfect…” where Felicity Cloake tries out several versions to find the perfect way to cook a particular recipe. 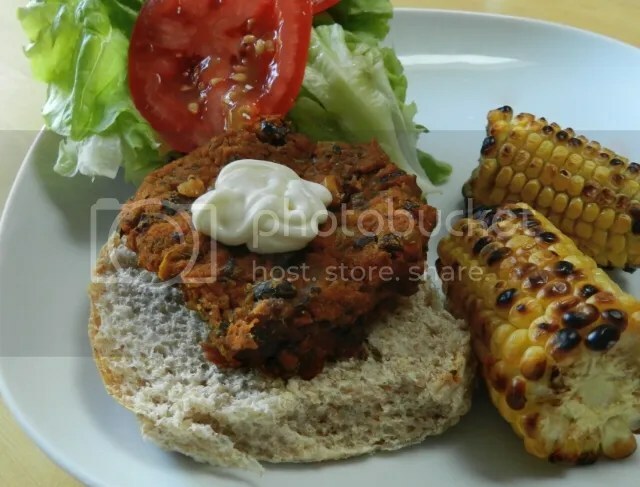 Recently, it was the turn of the perfect bean burger. It sounded good so I thought I’d give it a try. Simmer the broad beans, remove their skins and mash them lightly. Add the black beans, toasted cumin & coriander seeds and mash it all together. Fry the onion, pepper and garlic, add to the mix when cool. Form into patties and leave to firm up in the fridge. I didn’t have any jalapeño or chipotle chilli, so I stuck to the paprika. I didn’t have any cornmeal, either, so that got left out. My initial impression was that there was far too much paprika. 2 tsp is too much for that amount of mix. I would start with 1/2 tsp and add more from there. This is especially true for Sainsbury’s Smoked Paprika which is also very hot. I didn’t put any chilli in and it was nearly too hot for a friend of mine to finish. Be careful and taste as you go along. I hoped that I’d found a bean burger recipe that would stick together, but these didn’t. We did them on tin-foil on a barbecue and didn’t dare turn them. They were certainly flavourful, but really all you could taste was the paprika. I’ll do them again, but this time with much more caution on the spices.